I judge very interesting this chapter from the historical point of view.The covers and envelopes in this chapter, were sent toward battle zones or place already occupied by allies. These historical-postal covers were, usually, returned to the sender, because the difficulty to cross enemy lines. In this chapter, there are no rare pieces, and high value covers will not be found, indeed, these envelopes are most common. The value of the material under exposed is nearly exclusively historical. 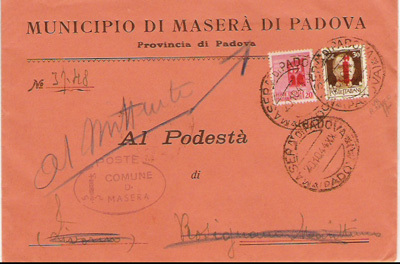 The first cover showed, was sent from Cento (Ferrara) to Pianoro (Bologna) This envelope shows the not common cancel "TO THE SENDER WAR EVENTS", made in Bologna. This cover was sent on November, 12 1944 and addressed to Pianoro, on the Bologna's Appennins. This envelope did not consigned why, in the zone, were furious fighting between the 5°Army and RSI units ( especially the Republican National Guard ) that will culminate with the breaking through the Appennins forehead on the following first months of 1945. The envelope over visible was sent from Milan on May, 15 1944 and addressed to Rome, where it never did not reach because the approximating of allies who occupied the Italian capital on successive June, 4. The envelope was returned to the sender on next 26 August. Other interesting object is the over represented envelope . This was sent on the November, 21 - 1944 from Milan to Vedrana di Budrio ( Bologna ). It reached regularly the post office on November 29 but, instead to be forwarded to the adressee, it was sent again to the sender because of approximating of allies to the zone. A disposition of the Ministry of the Communications in fact, previewed the evacuation and the closing all the post offices in a beam of approximately 80-100 Km from the theatres of the combats. At the date of the cancel, the war operations regarded the zone between Faenza and Forlì, approximately 85 Km from Vedrana di Budrio. The manually inscription on the frontispiece informs us that the envelope was returned to the sender on successive 12 December. The special delivery cover above, was sent from Brescia on July 30, 1944 and directed to Florence. This letter was returned to the sender why in that place were deployed allies troops that will occupy the city on August 3. The Podestà of Littoria ( now called Latina ) never did not receive this cover sent from Crespino, in province of Rovigo, on August 5, 1944. That city, in fact, was already occupied from allies since May 25, 1944. It was strange that the Authorities of Crispino, sender of this envelope, did not know this circumstance. The town of Rosignano was occupied by allies on July 7, 1944. The cover above was addressed to that town on October 20, 1944, so the cover was returned to the sender.